The author crossing the line at the 2013 Leadville Trail 100. Photo by Glen Delman. 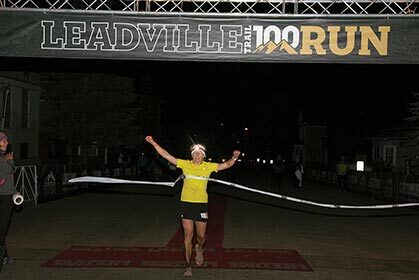 In 2013 I won the Leadville Trail 100—my dream since moving to Colorado in 2009. Soon, though, after the elation of victory melted away, I was bent over the toilet, engaging in self-destructive habits, feeling alone and hopeless as ever. The truth is that I’ve suffered from eating disorders—first anorexia and then bulimia, among a smattering of other “disordered eating” tendencies—for nearly 14 years. When I began running ultras five years ago, I saw a community full of happy, energetic people eager to share their world with newcomers. At first, I couldn’t understand it. I’d never been around such a condensed population of individuals who seemed to smile so widely after, often, suffering so intensely. The sport seemed more about being happy than it was about being competitive. And yet, the deeper I got into it, the more injury and burnout I saw. I overheard both men and women talking about ideal race weight, their daily diets, the pressure to be competitive—even among non-elite athletes. Three separate running partners have confessed to serious bouts of bulimia. Kurt Egli. Photo by Glen Delman. 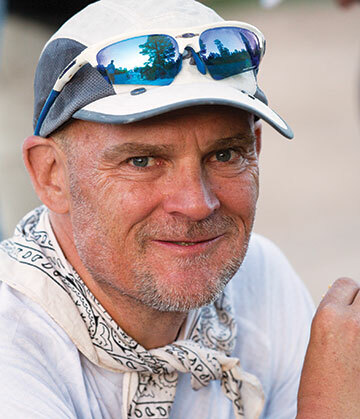 Kurt Egli, 52, an ultrarunner in Tulsa, Oklahoma, says he has come dangerously close to purging as a way to lose weight for competition, due to feelings of inadequacy when he sees other runners with wiry, slender frames. Egli is 5’11” and around 185 pounds, with a strong build. Compared to the general population, he’s rail thin—but not compared to those in the trail and triathlon communities. And Egli isn’t trying to break records. He’s just in love with the trails. Body-image issues are hiding behind more smiling faces in our sport than we know—and, often, they transform into full-fledged disorders. The National Eating Disorders Association (NEDA) defines eating disorders as “serious emotional and physical problems that can have life-threatening consequences.” While anorexia nervosa and bulimia nervosa are the most known disorders, the organization also recognizes several other disordered-eating behaviors, such as binge eating and purging disorder. Anorexia is a psychological disorder associated with highly restricted and controlled eating, an obsession with a thin figure and consequently a fear of gaining weight even if/when the individual is severely underweight. Bulimia is defined by binging, followed by vomiting or laxative use as a means to prevent weight gain. Both disorders can also sometimes be associated with excessive exercise. Eating disorders affect about 24 million people across the United States, according to NEDA. An estimated 85- to 90-percent is female. Athletes represent a subset within that population—one that is very different, says Isabelle Tierney, a Boulder, Colorado, life coach, counselor and founder of the Boulder County Eating Disorders Coalition. 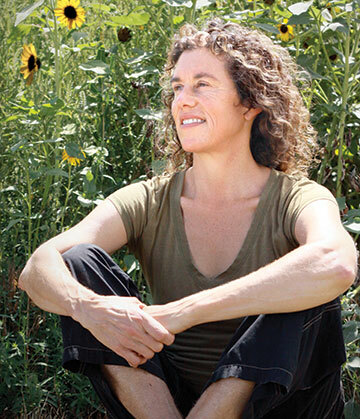 “We’re like a breed,” says Diane Israel, a former professional triathlete and a psychotherapist and professor of transpersonal psychology at Naropa University in Boulder, Colorado, who has also suffered from anorexia much of her life. “We get into athletics because we’re anxious, intense, hyper vigilant and sensitive.” And, she adds, this is the type of person most susceptible to having an eating disorder. But her anorexia isn’t all that defined her back then, or today. Israel was one of the first female pro triathletes, and she played a pivotal role in propelling Boulder into the endurance scene. A “never-quit” kind of athlete, she once suffered a violent fall during a 400-mile bike race that shredded her elbow. Even with bone poking out from her flesh, she kept riding until an orthopedic surgeon on the course forced her to go to the hospital. Diane Israel. Photo by Nick Pino. While this “tough-as-nails” attitude is often lauded in the athletic world, when you look at Israel as a whole—and others who share her tenacity—you start to see a pattern unfold. It is the need to prove something, whether to ourselves or to others—some striving toward perfection. For Israel, her anorexia stemmed from a need to feel “good enough.” When she was young, her mother was in and out of mental hospitals with manic depression. Her brother was institutionalized for mental retardation and, even as a young child, Israel deeply suffered with depression. Running, it turned out, freed her. The anorexia? It granted her something powerful—a sense of control. I grew up outside of city limits on 13 acres in the hills around Lexington, Kentucky, spending my summers catching fireflies, baking mud pies and exploring the surrounding thick woods and creeks and hunting for wild berries and honeysuckle with my friend, Blair, and my older sister, Lauren. While I spent much of my young life in those woods, I was in a gym four hours every weekday after school, save Friday, and eight hours on Saturday. As a competitive gymnast and dancer, I grew up in front of mirrors. Gymnastics is a sport built on being judged; your value is based on a score held up by three judges sitting behind a table. I was thin and sinewy strong, but, already by the age of 11, I was afraid of being fat. Olympic gymnasts weren’t fat. Famous dancers weren’t fat. The reasons I developed an eating disorder are far from that simple, though. As leading eating disorder researcher Dr. Carolyn Becker explains, “It’s complicated.” Indeed, it’s rarely one thing that causes an eating disorder. More often, it’s a combination of factors—a perfect storm. I quit gymnastics after a couple of close calls with injury. The lack of regular, intense athletic activity led me to join the track-and-field and cross-country teams my freshman year in high school, where I quickly learned the rewards of being thin. During my junior year of high school, by then a year deep into anorexia, I sputtered around at a waif-y 86 pounds. I stopped menstruating, so I visited a gynecologist who prescribed birth control and warned me about osteoporosis. Things came to a head at a 5K cross-country race in Danville, Kentucky. Standing on the starting line in the wet, southern fall air, I felt dizzy and heavy. When the gun went off, I darted into the lead, but soon my quads and hamstrings burned and my arms became too tired to pump anymore. And then, barely a mile into the race, I collapsed. My sister, Lauren, was close by and swooped in to help carry me, limp and crying, back to the start line. I sobbed, but agreed to see a doctor. I started on a strict iron intake and expanded my diet to include fish, potatoes, kale and other leafy greens and eggs. I hit 93 pounds, and, though still underweight, finished my senior year with a second-place state finish in the mile and a college running scholarship. According to NEDA, a staggering one third of college NCAA Division I female athletes have reported eating disorder-related symptoms, most from the sports that emphasize body size, such as running, wrestling and gymnastics. 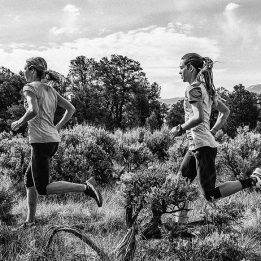 Elite runner Melody Fairchild, 41, of Boulder, Colorado, admits to dealing with the early stages of an eating disorder in middle school, when she first began to explore running. An unsettling situation at home during her teen years triggered struggles with body image and confidence. Her mother had been diagnosed with cancer, her father was an alcoholic and she had her first bout of social rejection at school. In ninth grade, Fairchild decided to stop eating the hearty lunches her mom made her every morning, and her weight started to drop. Like my sister had done, Fairchild’s sister sat her down and gave her a stern talking-to. For Fairchild, that conversation was the catalyst she needed. “I realized I was taking away this gift God gave me—to run,” says Fairchild. Running was vital to who she was. The sport empowered her unlike anything else and, because she realized the value of that, she was able to quell most of her body-image issues in high school. Her experiences led her to pursue a career empowering women athletes through coaching and camps. Fairchild has qualified twice for the Olympic Trials—once in the 10K and once in the marathon—and was part of two gold-medal-winning U.S. Mountain Running Teams. And she isn’t a hyper-thin runner. 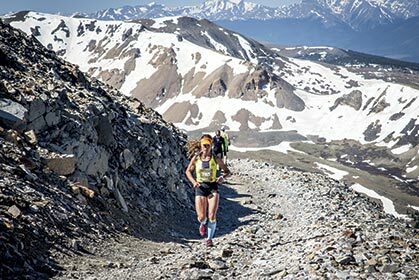 She is a powerhouse with strong mountain-climbing quads and calves—legs that, after 23 years of racing professionally, are still holding her up. At 18, I was loping around the track at South Carolina’s College of Charleston with six-percent body fat and weighing 97 pounds, still very much plagued by the idea that I did have to be the thinnest to be the best. I kept a strict daily record of my food intake and the number on the scale each morning. Eating was a solo and calculated ritual of slow bites and excessive amounts of water to fill my stomach. Often, I ended a meal lightheaded and overhydrated. Maintaining my weight was all consuming, leaving little time for other pursuits like making friends. After a particularly disappointing race at Duke University in North Carolina, I sat down in my coach’s office and told her I couldn’t run anymore. I gave up my scholarship and went out on my young-adult quest for meaning. Instead, I found partying and smoking and, alas, bulimia. That period in my life wasn’t all bad, though. I founded my own dance company and choreographed and performed all over Charleston, South Carolina, and ended 2008 with two choices: move to Philadelphia for a collaborative dance opportunity or head to Colorado to work for Trail Runner and see what the Rocky Mountains had to offer. Colorado called me in, and so, at 23, I headed west. Very quickly, trail running became my spiritual escape. My body image, though, was still anything but healthy. 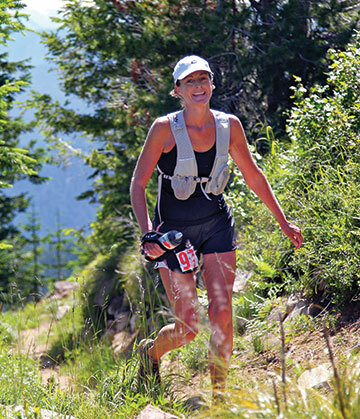 Erin Earle, 43, a self-described mid-pack trail ultrarunner from Bainbridge Island, Washington, has also suffered from anorexia for much of her life. Her parents divorced when she was young. She had a difficult relationship with her stepfather and suffered from clinical depression throughout most of her childhood. She felt inadequate when compared to her athletic family; her mom ran marathons and her brother was an accomplished rock climber. After being a “couch potato” through her teenage years, Earle joined the rowing team in college. There, she was weighed every day at practice. By her sophomore year, the pressure of that daily weigh-in sent her on a downward spiral toward anorexia. It also helped distract her from troubles at home. Erin Earle. Photo by Glenn Tachiyama. In her mid-20s, Earle was released from treatment and discovered running. “I was living in Japan and I was married—but not very happily—and part of my recovery was trying to find a strong, tough Erin who had a voice,” she says. 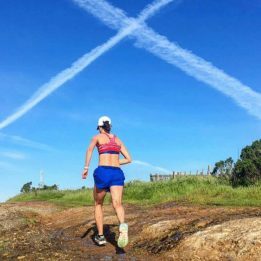 That version of herself turned out to be a runner, so she worked with a coach and made her dream of completing a marathon come true. And, she says, that marathon played a big role in her getting healthy again. The training forced her to eat a healthy diet, giving her the strength she needed to keep running. Years later, when Earle met her current fiancé, an ultrarunner, she decided to test the ultra waters with a 50K. She’s been running ultras ever since. Earle is confident, though, that her relationship with running is a healthy one. While she still deals with occasional negative body-image thoughts, overall, she feels happy. 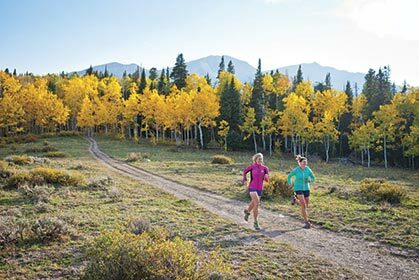 The author (left) and training partner Gina Lucrezi on a fall training run in western Colorado. Photo by Randall Levensaler. When I left my post as Associate Editor at Trail Runner in January 2013, I left to pursue the three things I love most—trail running, dance and writing. From an outside perspective, 2013 was a success in all three realms. Underneath the veil, though, I felt uncertain, lost and depressed. Bulimia crept back into my life. While I’d often throw up two to four times a week, sometimes it happened daily. 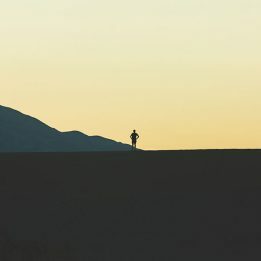 One particularly difficult week in May, just a few days after finishing the Desert Rats six-day stage race in Moab, Utah, I threw up every day. That weekend, I set out for a 20-mile training run with my friend and training partner, Gina Lucrezi. She was preparing for her second ultra and needed her training to be on-track and dialed. I only made it 10 miles before I began teetering around with exhaustion. I fell and twisted my ankle on a perfectly smooth section of trail. Gina noticed my pale face and told me I didn’t look so good. I brushed her off, slurring my words. Then, while passing some grazing cattle, I started hallucinating. We called our friend Jen to come pick us up. Studies suggest that, up until a point, for every pound you lose, your time over the mile will decrease by several seconds. And yet, when it comes to trail or ultrarunning, what about the muscle needed to climb and descend, or the fat reserves your body relies on for fuel when it’s burned through its glycogen stores? If we feel strong and fit, both physically and psychologically, could that be enough? To seek answers to these questions, Dr. Ron Thompson helped found the Victory Program—a new eating-disorder recovery program designed specifically for athletes—in St. Louis, Missouri, part of the McCallum Place, a pre-existing center for eating disorders. It is the first of its kind. Support at The Victory Program ranges from 24-hour live-in care to transitional housing in near-campus apartments. Dr. Thompson says he doesn’t allow patients to “exercise” but rather, allows them to “train”—the difference being that exercise is a general fitness term often seen as a means to weight loss, whereas training is focused on improving performance in a specific sport. Sport psychologists, dieticians and athletic trainers customize programs specific to an athlete’s needs. The athlete-patients learn to use techniques like motivational self-talk, visualization and goal setting both to enhance performance and to recover from eating disorders. Israel, though, argues this approach is still the “old way” of treating eating disorders. To her, it’s important to no longer demonize eating disorders—to see them not only as something to get rid of, but as a tool to help us navigate our lives. Though I question how something so destructive could be my teacher, perhaps in some “far out” way, Israel is on to something. I’ve learned a lot from trudging through anorexia and bulimia. I’ve recognized the dark places within myself and confronted my need for control, my feelings of inadequacy. Being healthy takes work, sure. But it’s easier than the alternative. I, too, can think back through my life to the wasted hours and energy I’ve devoted to this disease. What could I have accomplished instead with all that time? This isn’t to say I’m completely better; I’m not. I often still feel inadequate or lost. But talking about it—being honest with myself and others—helps. Letting go of shame helps. And trail running, when approached without obsession, helps.